On arrival at the Srinagar airport, transfer to your hstay. In the evening, enjoy a romantic Shikara ride on the picturesque Dal Lake (Shikara ride on direct payment basis). Stay overnight at hotel. Check out the houseboat and proceed to Pahalgam. On arrival, check-in at the hotel. Spend the evening at leisure and stay there overnight. Admire the beauty of this quiet place and be in awe of the serene surroundings. You can also enjoy a pony ride to nearby places like Chandanwadi (on a direct hire basis) or if you are an avid nature lover you may take pleasure in a peaceful walk along the River Lidder. Checkout the pahalagam hotel and proceed to Gulmarg. Gulmarg is located at an average elevation of 2,690 m (8,825 ft). Spend the day witnessing the picturesque locales like the Golf Course (Golf kit and caddy charges optional & extra). Also take the exhilarating cable car ride to Khilanmarg Snow Point (Gondola ride up to Khilanmarg is not included in the package and Gondola ride strongly depends on weather conditions) Have a comfortable overnight stay. Check out of the hotel in Gulmarg and proceed to Srinagar. On arrival, begin your excursion to Shankaracharya Hill Temple and Grand Mughal Gardens (Chashme Shahi, Nishat Bagh & Shalimar Bagh). Overnight stay at your hotel. 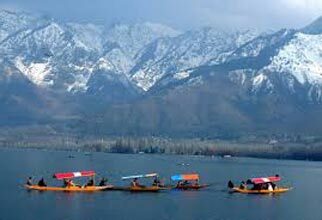 Day at leisure, enjoy the scenic beauty of Kashmir. Stay overnight at the hotel. Check out of the hotel, and proceed to Srinagar airport to board the scheduled flight for onward destination.